A mass grave has been discovered in the predominantly Shia city of Karbala south of Baghdad, Iraqi police said. Dozens of bodies have reportedly been found, apparently those of Shia rebels killed by Saddam Hussein's army after its defeat in the 1991 Gulf War. The Shia revolt was crushed and as many as 30,000 people were killed, many of them buried in mass graves. The remains were uncovered by workmen digging a new water pipe in the centre of the city known for its Shia shrine. They called the police, who cordoned off the area. Clothing found with the bodies indicated that they included men, women and children. "The remains of dozens of victims were found in the pit - some 500 metres from the mausoleum of Imam Hussein," Abdul Rahman, a Karbala police spokesman, told news agency AFP. Shia pilgrims converge on Karbala twice a year to mark the death of Hussein, the Prophet Muhammad's grandson, 1,300 years ago. 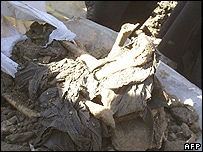 Several mass graves containing thousands of bodies have been uncovered since the fall of Saddam Hussein in April 2003, notably in the Shia south and Kurdish north. However, there have been concerns that most useful evidence from the graves has been destroyed as relatives tried to recover the remains of their loved ones. The former Iraqi leader and seven members of his regime are currently being tried for the killing of 148 people in Dujail in 1982. They all deny responsibility. Other charges are expected, including ones relating to the suppression of the 1991 uprisings, which were encouraged by the United States following the liberation of Kuwait, but not supported by coalition forces. The elite Republican Guard was able to crush the rebellion and tens of thousands of Shia across the south were imprisoned, tortured and killed. The holy shrines in Karbala and Najaf were smashed by the tanks and artillery of government forces. They were, however, quickly restored by the government.